Sixteen residents from Bayanijuan in Southville 7, Calauan, Laguna were recently granted National Certification II on passing the housekeeping training. Officers (L-R Standing) Eurotel Training Director Shirley Bron, Bayanijuan Officer-in-Charge Leah Bautista, Eurotel Sector Head Cesar Canabal (4th from the right) and Eurotel Managing Director William Go (rightmost). Melba Valera, or Ate Eba, as what her neighbors and friends fondly call her, was all teary-eyed while delivering her very first speech. “Nagpapasalamat po ako dahil sa konting pagsasama natin marami po kaming natutunan sa inyo [Eurotel], at sa lahat po ng tinuro niyo samin, tinatak po namin sa isip namin. Pinagpuyatan po namin itong lahat para makapasa dito. Sa mga kasama ko, good job! Nakaya nating lahat. Maraming salamat po!” Ate Eba expressed. 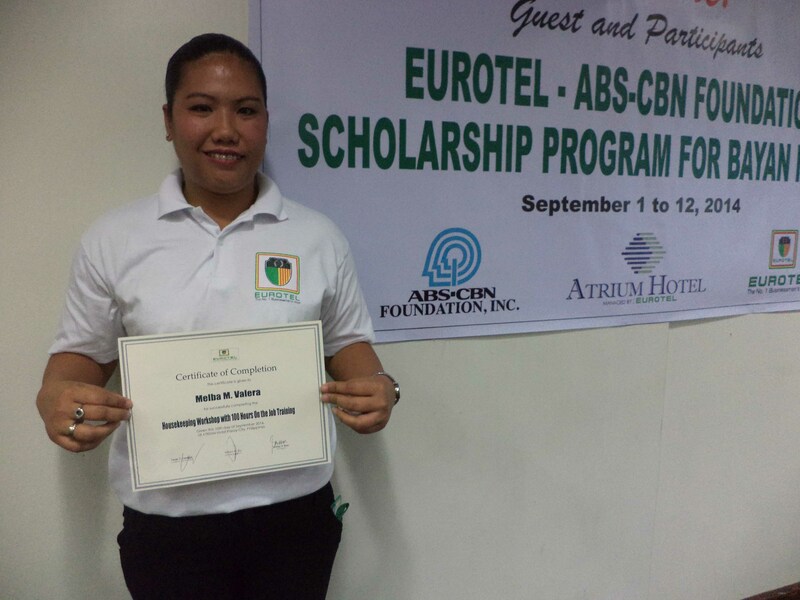 Ate Eba is one of the sixteen graduates of ten-day training course on housekeeping recently organized by Eurotel Philippines, Bayan Academy and ABS-CBN Lingkod Kapamilya Foundation, Inc. The graduates, who used to live along the esteros in Metro Manila, now reside in Lingkod Kapamilya’s official resettlement site – Bayanijuan in Southville 7 in Calauan, Laguna. Eurotel Managing Director William Go shared his first visit in Bayanijuan and from there he saw the potential of the residents to become productive members of the society. 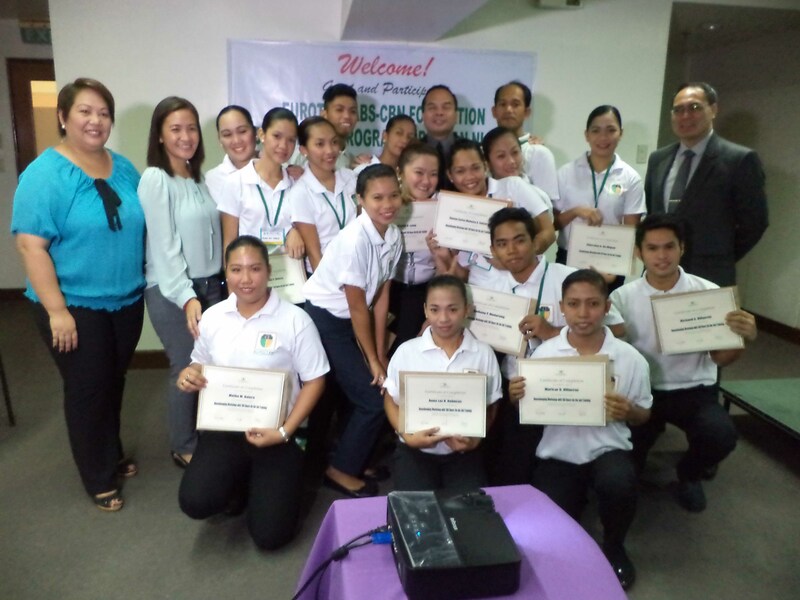 “We are very proud to say that all the trainees from Bayanijuan passed the National Certification II Training on Housekeeping. This certification is a guarantee that they can already be employed because NCII is recognized not only in the Philippines, but also abroad,” Go articulated. Bayanijuan Officer-in-Charge Leah Bautista lauded the notable partnership with Eurotel and other organizations because it provided skills training for the worthy residents. “When I saw the graduates, I hardly recognized them at first. They look very different as compared when they were in Calauan. To the graduates, I see something special in you. Now you are truly proud of yourselves because of this achievement,” Bautista said. ABS-CBN Lingkod Kapamilya and Eurotel shall expand the training courses to be offered to qualified Bayanijuan residents. Eurotel also seeks to bring BNJ’s locally-made products to its affiliates abroad. ABS-CBN Lingkod Kapamilya Foundation, Inc. commits to make a significant impact in the strategic areas of child care, environment, education and disaster management by leveraging the power and reach of media and partnering with concerned sectors of society. Visit http://10.1.16.183/ to know more about ALKFI. Melba Valera proudly shows her certificate after passing the housekeeping training.